This post is part of the Donohoo Descendancy Project. Michael Donohoo was a son of Patrick and Sarah Donohoo. Michael Donohoo was born in 1811 in Baltimore, Maryland, the third child and second son of Patrick and Sarah Donohoo. When he was five years old, the family moved from Baltimore to Bardstown, Kentucky, where his father continued to work as a shoemaker. In October of 1836, 25 year old Michael married 19 year old Caroline Green [1, 2].The couple would welcome 11 children (5 sons, 6 daughters) into their family over the next 25 years, and say sad goodbyes to three of their daughters before they reached adulthood. Michael bought significant amounts of property throughout the 1840s and 1850s, including the Bardstown Hotel [3, 4]. Michael became a prominent member of the Bardstown society, and proprietor of this well-reputed way station for travelers. The Bardstown Hotel has been in continuous service in Bardstown under many names and owners since at least 1797. The property has been known as the Old Stone Tavern, Hynes House, the Donohoo Hotel, Newman House, etc., now today called the Talbott Tavern . Old Talbott Tavern by C. Bedford Crenshaw. Our Trip. The Lebanon Post, August 23, 1854. 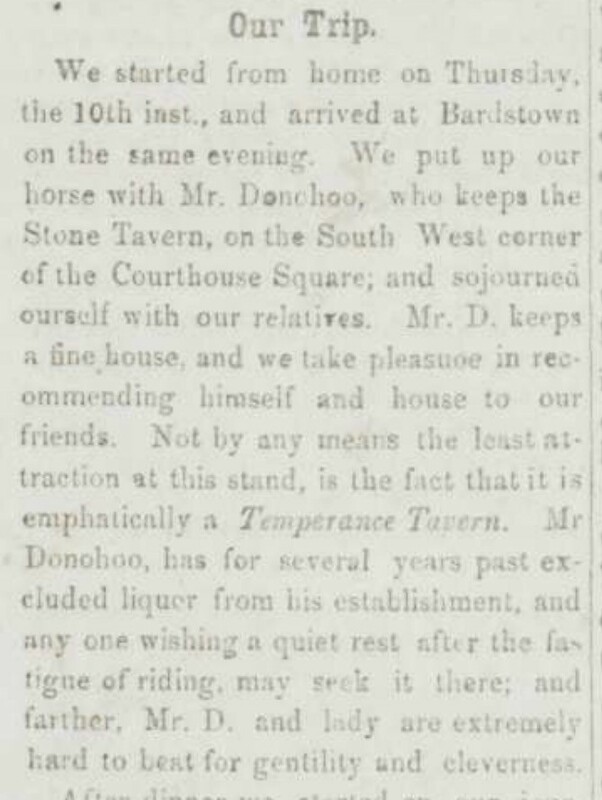 Interestingly, the Donohoo Hotel was one of several temperance taverns of its day . Whether this was a part of the larger temperance movement of the era, or whether Michael Donohoo felt it was part of his staunch Catholic religious duty, is unknown. It seems, however, that this aspect of his business helped his reputation. While one could not get an alcoholic drink there, they could put up an animal, eat a meal, and stay for the night. In April of 1856, a huge fire spread through a large portion of Bardstown (see Conflagration! The Bardstown Fire of 1856). The Donohoo Hotel was spared, but Michael’s father, sisters, brother, nieces and nephews, twelve family members in all, lost their homes and all household goods. One of the homes was owned by Michael. As an owner of several properties, it is very likely that Michael provided shelter and goods for his family after this devastating loss. “Accommodation Stage Line.” Daily Louisville Democrat, August 5, 1856. “Accommodation Stage Line, Louisville and Bardstown! 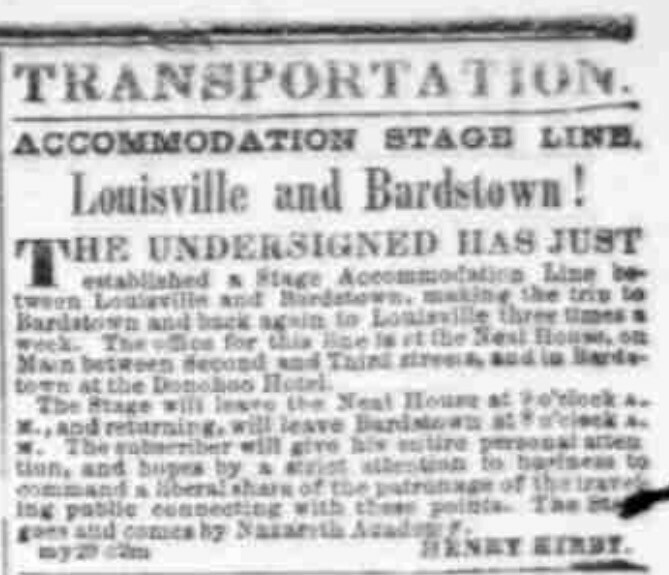 “The undersigned has just established a Stage Accommodation Line between Louisville and Bardstown, making the trip to Bardstown and back again to Louisville three times a week. The office for this line is at the Neal House, on Main between Second and Third streets, and in Bardstown at the Donohoo Hotel. Michael owned several slaves who helped him run his tavern and hotel. In 1850, he owned seven slaves, increasing (due to babies born to the slaves) to nine slaves by 1860 [9, 10]. One of his slaves was Harriet Mathers Walters, “tall and commanding in figure, of a light brown complexion and the embodiment of energy. She weighed over two hundred pounds and possessed unusual strength for a woman. In another confrontation, Michael reprimanded Harriet harshly for serving a late breakfast. She, feeling the reprimand was unjust, threw a rolling pin at her master. He threatened to sell her for this offense, and nearly went through with the sale, except for the adamant refusal of his wife, Caroline, to allow the sale. Harriet and her children remained in the Donohoo household until emancipation . In April 1865, Michael sold a house to his sister Catherine Turner for the sum of $750. The deed notes that she already resided in the house, and the house was located adjacent to the Tavern across an alley to the west . 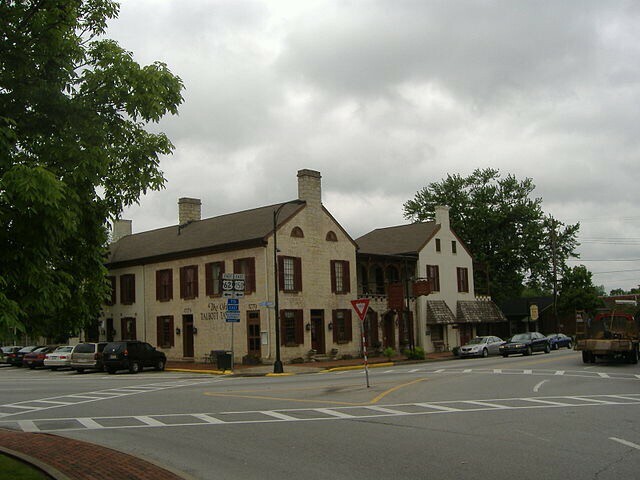 In July 1865, Michael sold the Bardstown Hotel to George W. Robertson for $6000 . Even though he left the hotel business behind, Michael used the sale proceeds to buy more properties over the next few years. Michael Donohoo died of heart disease on the 8th of August 1876 . In his last will and testament, he left everything “to my beloved wife Caroline Donohoo to use enjoy and dispose of as she may desire for ever.”  He was a man of contrasts: father of a large family, good provider for not only his own wife and children, but generous to his extended family in their need. He was a firm Catholic and a supporter of the temperance movement. He was also a slave owner, a shrewd businessman and perhaps a man with a hot temper. He most certainly had strong adoration for his beloved wife. Image: Old Talbott Tavern by C. Bedford Crenshaw. Creative Commons License. Accessed at commons.wikimedia.org on 1 June 2016. Temperance Movement. https://www.wikipedia.org/wiki/Temperance_movement Accessed on 1 June 2016. “Accommodation Stage Line.” Daily Louisville Democrat, August 5, 1856. Repository:University of Kentucky. Accessed at Kentucky Digital Library: http://kdl.kyvl.org on 23 December 2014. Nelson County, Kentucky deeds, 1785-1904; Deeds, v. 32-33 1860-1865. Salt Lake City, Utah : Filmed by the Genealogical Society of Utah, 1966. Microfilm of originals at Bardstown, Kentucky. Family History Library Film 483140. Index record transcript: 1865, Catherine Turner, grantor M. Donohoo & wife, deed book 33, page 562. Nelson County, Kentucky deeds, 1785-1904; Deeds, v. 32-33 1860-1865. Salt Lake City, Utah : Filmed by the Genealogical Society of Utah, 1966. Microfilm of originals at Bardstown, Kentucky. Family History Library Film 483140. Index record transcript: 1865, Michael Donohoo, grantee George W. Robertson, deed 33, page 619. I found a picture of the Donohoo building that was the only building in Bardstown that had 4 stories. It was torn down to make space for a Ford Dealership. The site is now a parking lot for a bank. The Donohoo’s who owned this building were in your line. A certain house and lot in Bardstown, Nelson County, KY. and being a part of lot No. 20 on the plat of Bardstown, KY., bounded on the east by Third Street, on the North by an alley. On the West by the Lewis lot and on the South by Miss Gardner’s lot being the same to which Sarah Donohoo derived title by deed dated October 25, 1889 from J.E. (this is incorrect, should be J.F.) Donohoo and recorded in D.B. 55 page 332 in Nelson County Clerk’s office. Said Property will be sold for debt and interest of plaintiff Sarah Donohoo amounting on day of sale to $716.39 an estimate cost of $40 and also the amount of debt and interest of plaintiff William Higgins amounting on day of sale to $716.39 and estimated costs of $40.00 total debt interest and cost for which this property will be sold $1512.78. I don’t see anyplace that will allow me to attach this image. Get back to me and I will attach the image I found. Thank you for this great info! I would love to see the photo. I have emailed you so you can send me a copy of the photo.